In addition to the regular wear-n-tear on the old body that is anesthesia and surgery in general, I’m healing from a couple of very specific “injuries” from the procedure. Disclaimer: this picture is pretty gross, so if you have a weak stomach or get sicked out easily, scroll down now. The little red spot in the photo is the site of a couple of stitches, and they itch and pull a bit as they heal. There are 8 or so spots on my legs and chest; I haven’t counted all of them because frankly I haven’t been brave enough to look that closely. I also have 4 open “poke holes” that drained a bunch of yucky stuff the first two days but are healing up nicely now. I expect the stitches will come out sometime this week. A slight complication arose yesterday: I didn’t feel good. A slight fever, sore throat, extreme fatigue, and overall malaise ruled. My doc asked me to call him over the weekend, especially if the fever didn’t go away. I appreciate how accessible he is to his patients, even on the weekends. When my fever spiked yesterday afternoon and didn’t break, and when my skin at the original infection site became red, warm, and streaky, I knew I needed to call him but didn’t want to interrupt my weekend either. I stayed in my jammies and laid around all day yesterday, and when I didn’t feel a whole lot better this morning, I called. That sounds so unlike me (ha!). He knew that if I was in a bad way, I would call him, and I knew that it could wait until today. No need to go getting ahead of ourselves and risk getting myself admitted to the hospital on a Sunday night. The fever was down this morning, and the red, warm, and streaky spot looked a little better. The pain is still there, but not as intense as yesterday. It feels like a hot, localized pinch. If I didn’t know that feeling so well from my multiple run-ins with post-surgery infection, I might think one of the stitches was pulling or it was just part of the healing process. But I know better. After much poking and prodding of the hotspot, we decided to let it be and wait and see. I thought for sure he’d want to open it up and see if there was fluid to collect and culture, but he said nope, not at this stage, let’s give the newly rounded chest a chance to settle this on its own without us intervening. He extended my course of oral antibiotics just to be on the safe side, and as much as it pains me to admit this, I agree with him on both fronts. Really, we’ve done everything we can to prevent infection: a week of pre-surgery prophylactic antibiotics, 2 bags of 2 different IV antibiotics during the surgery, more oral antibiotics after surgery, the most thorough scrub-in process in the history of modern medicine, and over-the-top precautions to preserve a sterile field in the OR. At this point, if the infection can combat all of that, I will concede. But I will be a very sore loser. The one thing we’ve got going for us in the anti-infection camp is the fact that this last surgery didn’t involve any foreign bodies. 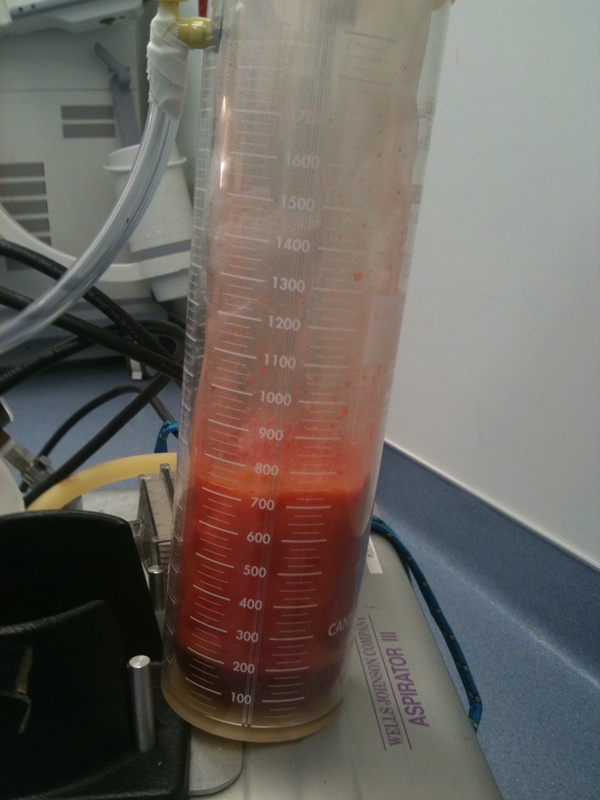 No tissue expanders and no implants, just good old-fashioned fat. It was sucked right out of my thighs (hence the super bruises) and injected right into my sunken chest. He carefully explained the fat-extraction process to Trevor and Amy while I was in the recovery room. The good news: I feel a lot better than I did yesterday. The bad news: I have a slight fever. No one is thinking infection thoughts yet but blaming it on the trauma my body endured yesterday. We took every precaution, including 2 bags of antibiotics via IV (Levaquin and my old friend Vancomycin) and a thorough pre-surgery scrub-down, with enough betadine to cover a small village, applied by 2 nurses and the good doctor himself. Yes, he scrubbed me down with betadine himself. How’s that for red-carpet service? More on that later; you haven’t lived until you’ve experienced something like that. 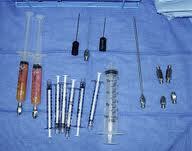 Long story short, the surgery was successful and the after-effects are manageable. I’m not going to lie and say I feel great, but I’m not barfing any more, so progress is being made. I was trying to figure out, though, why I feel so crappy considering this is the easiest surgery to date; then I realized it’s because for all the other surgeries, I’ve been in the hospital with a morphine pump and shots of morphine in my booty. That’s the difference. My doc changed his game plan just before going into the OR: instead of taking fat from my inner thighs to plump up my collapsed chest, he went for the “flank” area which is more commonly known as ye olde saddlebags. I’ve got about half a dozen incisions that are stitched up on my flanks and chest, and two “poke holes” near my hips that he left unstitched so they can drain. Lots and lots of bruising. I look like I was run over repeatedly by a Hummer, and feel like it too. Nothing unexpected, though. I’m not certain because I was pretty groggy, but I think we got home about 3:00 yesterday, and I started barfing shortly thereafter. Being an all-or-nothing kind of girl, I kept it up until bedtime. I will admit to a momentary panic when I couldn’t keep down Jello or a banana, but realized that food plus moving around was problematic. Stop moving, stop barfing. I like simplicity. One I settled in bed, I was still queasy but not barfing. I have already been to see the good doctor and we are both very pleased with his handiwork. He’s not so pleased with the fever, but no one is in panic mode just yet. We’re in watch-it-and-see mode. Fingers crossed, of course. I’ll see him again tomorrow morning and will hopefully be fever-free. I’ve been slowly but surely freaking out about this surgery. I was all ready for it this time last week, but it was not to be. Having to wait a week because of pokey construction at the surgical center didn’t make me happy; I don’t like to wait in general, and on something this big and this important, even less. If there’s more than one person in line ahead of me at the grocery store, I consider that a long wait, so imagine what waiting a week has been like. The wait is over and the day is here. I’m ready. I prepared in numerous ways, including waking up multiple times each night; making myself half crazy with worry; imagining every possible way the dreaded infection could sneak back into my life; going overboard on stocking the house with groceries; meeting myself coming and going with laundry and errands; and cooking meals that my children won’t eat. I also did the one things I really should not have done, and that I also did the night before The Big Dig, aka reconstruction: I watched the surgery on youtube. No wonder I can’t sleep at night. Why do I do this to myself? I know full good and well that watching that stuff is going to creep me out. Picturing my beloved doc doing those things while I’m sawing logs really creeps me out. I trust him with my life but hate to think of what he’ll be doing to me this morning. I’m gonna be one sore chica. I scrubbed myself with Hibiclens this morning, to kill off any friendly or hostile bacteria living on my skin. You know your life has changed — and not for the better — when you have a bottle of the Hib in your shower (insert sad face here). Here’s the game plan: I’ll show up at the surgery center at 8 a.m. without having had my daily cup of coffee or one bite of food since bedtime (I’m not very pleasant when I’m hungry; I’ll be the first to say it. And BTW, packing my kids’ lunches without being able to have one bite of food myself is cruel. There’s not much in their lunches I would eat anyway, but still). I’ll put on the hospital gown and shower cap, and possibly the compression hose. 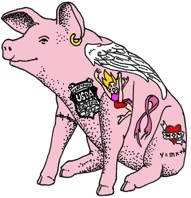 I’ll get marked up by my doc, which involves standing naked in a small room while he peers at and examines up-close the fattiest parts of my body; he’ll use a Sharpie to annotate the choice cuts that he’ll be removing, and I’ll try to slink into the OR with my dignity intact. I’ll endure the inevitable digging by the anesthesiologist and/or nurse anesthetist in a fruitless attempt to find a vein that doesn’t roll over and play dead; this usually involves multiple pokes and results in a giant bruise. I’ll watch the clock and wonder how much longer until they give me the shot that makes none of this hardship matter as I drift off into a heavy-limbed, blissful sleep. I’ll endure who-knows-what kind of horror show as my doc and his team manipulate and position my sleeping carcass to extract maximum fattiness. Some he will keep, and some he will throw away. The fattiness he keeps will be spun in a centrifuge to extract all the liquid. Then the liquid-free, pure fattiness will be injected into my sunken chest. I’ll wake up in the recovery room several hours later, trying not to barf and thinking how good it will feel to get home and leave the hospital stink behind. I’ll hope that I get home before my kids’ school day ends, and will hopefully, fingers crossed, please, please, please be one step closer to reaching the finish line and being done with the aftermath of breast cancer. That’s me. I admit it. Yesterday was the first day of school, yet did I take one photo of my kids before they descended into the joys of another school year? Nope. Not even with my iPhone camera. How lazy & shiftless is that? 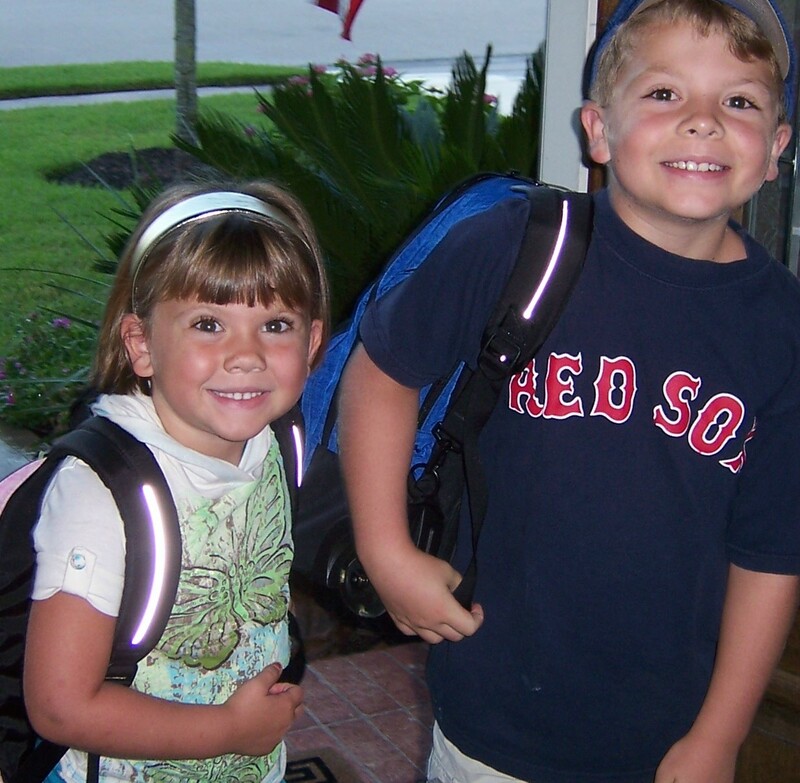 It occurred to me at some point last night that this will be the first year on record without a back-to-school photo, and I suppose I could have hauled Macy out of bed and pried Payton away from ESPN long enough to recreate a photo. But it would have been dark on the front step, where we always take the photo, and Macy would have had to change out of her jammies and back into her school clothes, which were no doubt in a heap on her bedroom floor. I had to admit defeat and accept that it wasn’t going to happen this year. A second-day-of-school photo seems too lame to contemplate, so this will be the year with no back-to-school photo. Macy’s entre into 4th grade and Payton’s into 7th will go unchronicled for time immemorial. And yet, I think we will survive. I’ll throw in a classic back-to-school photo, from Macy’s kindergarten and Payton’s 3rd grade year. That’ll do, right? Chalk it up to cancer fatigue, or to pre-surgery jitters, or to me being a slacker mom. Either one. The reason isn’t all that important, really. The kids don’t really care if we have a photo, and I’m pretty much over it as well. 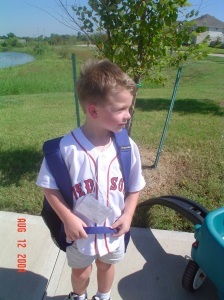 I will state for the record, however, that Payton did indeed wear a Red Sox shirt for the first day of school, as has been his tradition since kindergarten. Some things never change. If you thought I was done with my slacker mom antics and were ready to forgive me, hang on. True, it’s been a rough ride. It’s been a long year, full of medical drama and pain & suffering. I feel perfectly comfortable saying I deserve a free pass from juggling all the balls, getting everything right, and catering to everyone’s individual needs (ok, maybe that last one is going a bit far; I’m not much of a caterer). However, life goes on and I’ve yet to find the slot into which I insert my free pass. I’m looking for something like the coupon slot at the grocery store self-checkout, but I haven’t found it. Also curiously absent is the “make it so” button — push the button and make it so, whatever “it” happens to be. In this case, it would be the back-to-school photo. I would push the “make it so button” and a photo would fall out of the sky, into my cupped hands. If only. I certainly needed the “make it so” button last night, when Macy’s loose tooth came out just as she was getting into bed. She has been wiggling it for days, and it was hanging by a thread, or a root, or whatever loose teeth use to hang on. She emerged from her bedroom clutching a slightly bloody molar, grinning hugely and aquiver with anticipation about the upcoming visit from the Tooth Fairy. Slacker mom was not prepared for this. See, Macy and the Tooth Fairy have a “special bond” as she described through her tears this morning. The Tooth Fairy doesn’t just leave a few bucks or some loose change, like she does for most kids. Her Royal Dental Highness knows that Macy isn’t at all concerned with or motivated by money. She likes stuff. She’s funny and quirky and a bit outside of the box. And the Tooth Fairy is usually well-stocked. Lip gloss, a stuffed animal, a stationery set…things like that rock Macy’s world. The Tooth Fairy usually picks up such items throughout the year, as she’s running her errands and comes across something that she knows Macy would like. But the Tooth Fairy was ill-prepared this time. Even though she knew that tooth was loose, the light didn’t come on and make her think, hmmmm, I better make sure I have a nice prize for Macy when that tooth comes out. So the Tooth Fairy was forced to resort to the lowest common denominator, and she left a $5 bill. Macy was not amused. See, she had written a note to the Tooth Fairy, which she always does, and asked for a unicorn Domo. I imagine the Tooth Fairy said WTF?? I know I did. 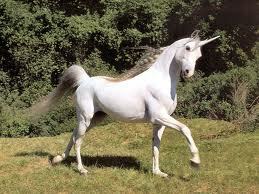 I’m fairly certain that a unicorn Domo does not exist. Or it does, but only in Macy’s imagination. 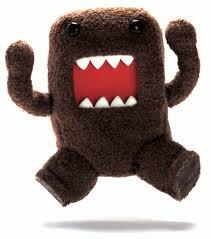 I guess it would be a cross-breed between a unicorn and Domo. Interesting. But not readily available, and certainly not at 9:30 at night. See my dilemma? I had no problem finding images of these guys on googleimages. 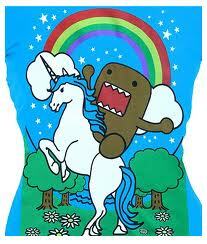 I even found a t-shirt of Domo riding a unicorn, which I was all set to order pronto but it’s sold out online. Of course it is. Who wouldn’t want a t-shirt like this? If I find one for Macy, I may have to get one for me too. I can see why the Tooth Fairy flubbed this one, big time. Some requests are too tricky and unique, even for the TF. 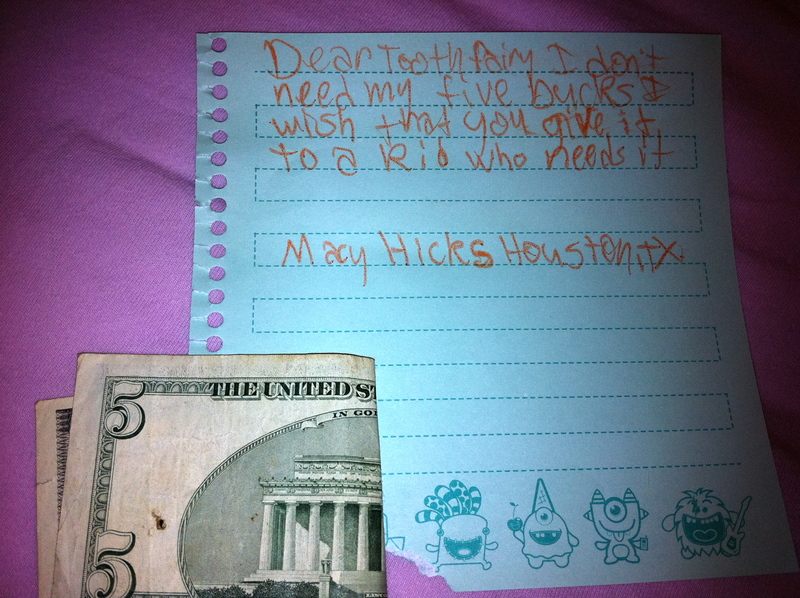 Macy wrote another note, which she expects the Tooth Fairy will collect tonight as she makes her rounds. 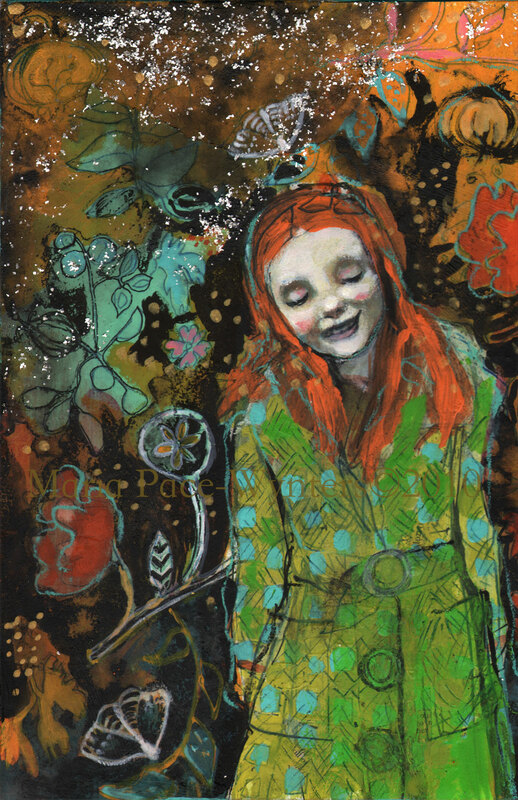 The “special bond” between Macy and the Tooth Fairy is splintered, but not beyond repair. As I may have mentioned once or twice in this space, I love champagne. It’s one of my all-time favorite things on Earth. Now that my kids are off to school (hallelujah!) I have plenty of time to wax poetic about my favorite drink. 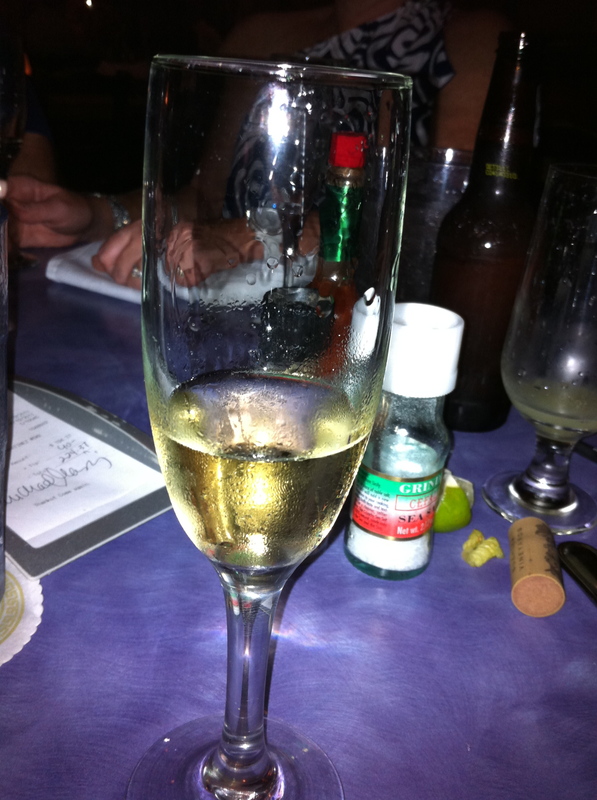 I could drink champagne every day; contrary to popular opinion, a special occasion is not necessary. But there’s nothing more festive and celebratory than the pop of a cork. and I don’t hesitate to find a reason to drink some bubbly. National Pancake Day? Bring it on. Armistice Day? Don’t mind if I do. Birthdays & major holidays? Duh. International Margarita Day? I’m not afraid to mix my liquors. 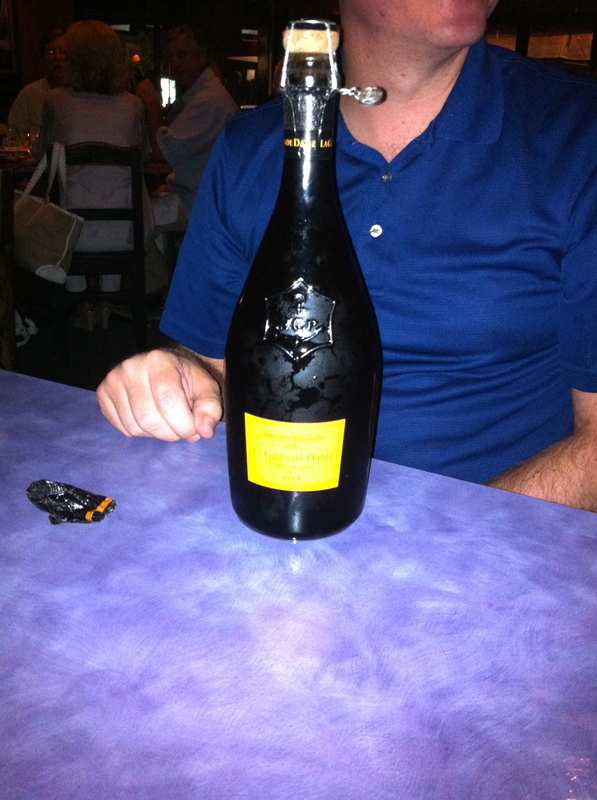 I’ve long been a fan of Veuve Clicquot, and this weekend was treated to the best of the best when it comes to my favorite yellow-labeled bottle: La Grande Dame. One word: yum. 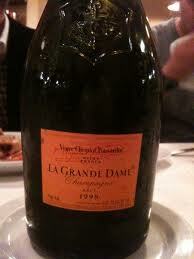 Not only is La Grande Dame a superb champagne, it also has a great story behind it. Barbe-Nicole Ponsardin married Francois Clicquot and was widowed after 7 years during the late 1700s. Francois left his family’s business — champagne-making — to her. At age 27 and knowing little of the fledgling business, she took the reins of the company and never looked back. She invented champagne-making techniques that are still in use today, and those greatly reduced production time, which means less time for the bubbly to get in my glass. She became one of the shrewdest — and wealthiest — businesswomen in France, and IMHO she deserves a place in history. There’s a book about her called The Widow Clicquot: The Story of a Champagne Empire and the Woman Who Ruled It. I’m a sucker for girl-power stories, so I bought the book, but had trouble reading it because it made me so dadgum thirsty. There are a few things I was able to glean, though, that are worth sharing about the widow who was “a young witness to the dramatic events of the French Revolution and a new widow during the chaotic years of the Napoleonic Wars.” Sounds exciting even without the bubbly. Barbe-Nicole rebelled against convention by taking over the Clicquot family wine business. She was brave and ballsy, and through “dizzying political and financial reversals” she became one of the world’s first great businesswomen. 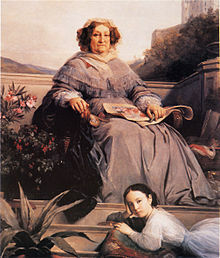 By her late 30s, she was one of the richest women in France. Clicquot sales are estimated to have been $30 million a year under her command. One of her lasting legacies was to portray champagne drinking as a lifestyle. She “took champagne from marginal to mainstream and made it synonymous with style,” according to the book about her. I’m not a big French Revolution history buff, and I won’t bore anyone with the details on the first day of school (hooray!!! ), but suffice to say that Barbe-Nicole was smart enough to realize that if she could get the Russians hooked on her bubbly, she’s have it made. She “arranged clandestine and perilous champagne deliveries to Russia one day and entertained Napoleon and Josephine Bonaparte on another.” Toward the end of the Napoleonic Wars, she cornered the Russian market by gambling 10,000 bottles of her best vintage. The Russians took the bait, and she became the queen of the bubbly. Good thing she was so brave and savvy, because she wasn’t much of a looker. The occasion for my enormous treat surprisingly had nothing at all to do with cancer. 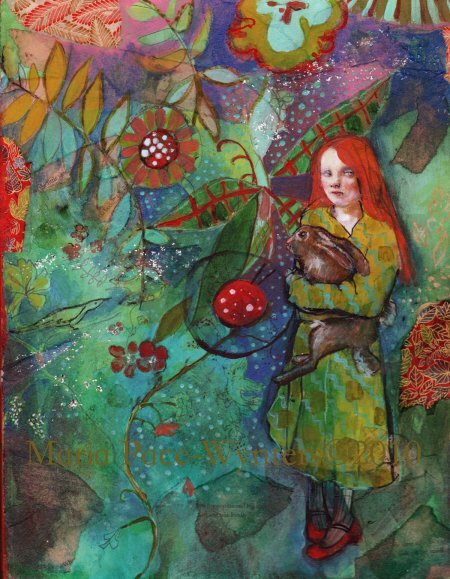 It wasn’t the marking of a milestone or the celebration of a clear scan or other good news. It wasn’t a drowning of sorrows, which is a very good thing, because all the drinking that’s been required since cancer came to town would make a very deep river. No, the occasion was a reward for a little party-planning provided for my runnin’ buddy Staci’s 40th birthday fete. I helped her hubby, my buddy The Rajah, plan her soiree and he was kind enough to show his appreciation by flashing the beloved yellow bottle. He’d been teasing me with it for weeks while I was out of town, texting to tell me he was making mimosas with it — oh the horror! The humanity! The thought of mixing such a fine wine made me nearly weep. He’s soooooo funny. In the end, however, there were no mimosas, just sweet, straight bubbly — the nectar of the gods. The moment just before the lovely lady was opened, at La Vista (which is such a great restaurant. If you live anywhere near Houston and haven’t eaten there — go there tonight!!). It was a beautiful moment, ripe with anticipation. The bottle glistened with condensation after being chilled in an ice bucket table-side. I kept it as close to me as possible while it chilled. I fretted over it like it was a newborn baby fussing in a Moses basket — was it cold enough? too cold? just right? As soon as I heard the pop of the cork, I knew — it was indeed just right. Tiny, tiny bubbles that hit the bottom of the glass and skyrocketed upward in an elegant trip to the open mouth of the glass. Beautiful amber color, like the last rays of the sunset after a most-perfect day. Teensy hint of fruit and even teensier hint of yeast. The delicate scent of bubbles and dry-but-not-bitter loveliness. From the first sip, it was apparent that this was vintage. This was the good stuff. Well, nature certainly did offer a concordance of perfect conditions, when a group of friends gathered at the end of the summer to celebrate the passage of time, the newest member of the “over-40 club,” and the savoring of the finer things in life. Cheers to the good life! And thanks, Rajah!